Budds In Surfers i Surfers Paradise, Australien : Boka nu! A $20 refundable cash key deposit is required upon check-in. No BYO (no bring your own alcohol due to Queensland Liquor Laws). Max of 4 people per room, female only rooms on request, shared bathroom, shared kitchen. At Budds in Surfers Backpackers we strive to make travellers around the world feel welcome and provide a comfortable stay for all our guests. We are a sociable and relaxed hostel with a great vibe, nightly events and food nights! We are conveniently located only 300 meters away from the iconic Surfers Paradise beach, a 5-minute walk from the city center and 10 minutes from the transit center. We are also currently renovating the hostel and have just installed brand new AIR CON in all the rooms! -Nightly events, including the famous Backpackers Big Night Out every Wednesday and Saturday! All rooms contain personal lockers and air conditioning. Please note that the hostel has a policy of accepting only ages 18+ with a maximum age of 35 for the dorm rooms. Also, we can only accept international passports/photo ID for the dorm rooms. 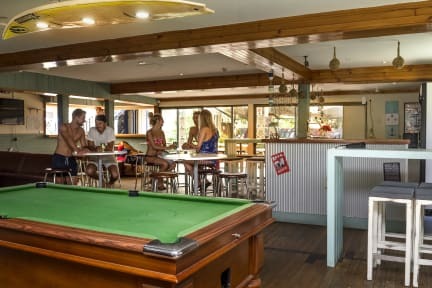 We are looking forward to seeing you soon at Budds in Surfers Backpackers! All guests must have a valid passport or driver's license in order to check-in. All guests must be over the age of 18. A $1 surcharge will be added to all eftpos and credit card transactions. Sorry we can not accept American Express credit cards. A 2% surcharge will be added to all eftpos and credit card transactions. Full payment may be taken once inside the non cancellation period. Budds is closed on Christmas Day and New Years Day for check in and check out. Group bookings are available upon request only. Great stay, loved every minute. Pros: nice pool, good breakfast, good common areas, many showers and bathrooms. Cons: quite a walk from busstop and shops, really loud party music across the whole hostel from 10 am until night, no aircon. We stayed here for three nights and I most say that it's probably the dirtiest hostel I've ever stayed at. They don't have professional cleaners instead there is guest from the hostel that cleans either for money or free stay I don't know, but they aren't doing any good job. And the kitchen is the worst I've ever seen, we didnt even wanna cook in there and it was terribly hot when you were gonna cook something. On the good side the staff was really nice and the free breakfast was okey! I stayed 3 nights. I didn't enjoyed it at all. The staff wasn't really helpful, it smelled really weird in the rooms, the kitchen was terrible. I wouldn't recommend this hostel. This place were not fresh at all, the rooms were way too small and smelled really bad, no air con, just a tiny fan that didn't do nothing. Staff were ok, not very friendly, the kitchen smelled moldy. I wasn't happy about this place at all! Don't waste your money, choose another hostel.